Pipelines for shipping oil in Canada keep getting cancelled or bought up and then pretend to be worked on. But shipping oil by rail keeps rising. Oil by rail is not as safe as a pipeline. 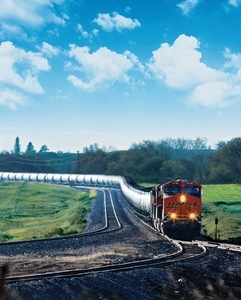 A pipeline is the safest and cheapest method to move oil; railway is the second cheapest way, he said. “If you increase the amount of transportation, sooner or later you will have some incidents that will be happening,” Chen said. There is oil to be moved. Obama has cancelled Keystone XL. So Warren Buffet and his railway the BNSF (and other railways) are stepping up and building thousands of miles of new track. Right through the middle of cities. Last week, under pressure from companies including Buffett’s BNSF Railway Co, which has spent more money lobbying Congress this year than any other railroad, U.S. legislators passed, and President Obama signed, a law that delays the so-called positive train control mandate for at least three years, with the possibility of an additional two-year delay. There is oil to be moved. Obama and company keeps delaying approval of the Keystone XL. So Warren Buffet and his railway the BNSF (and other railways) are stepping up and building thousands of miles of new track. -$162 million to double track the rail line from Minot, N.D., to Glasgow, Mont., to help address major congestion issues for westbound traffic to destinations in the Pacific Northwest. -$26 million to add sub sidings to address congestion from Fargo, N.D., to Grand Forks, N.D.
-$14 million to add sub sidings to address congestion from Fargo, N.D., to Glendive, Mont. -$13 million to add sub sidings to address congestion from Minot, N.D., to Grand Forks, N.D.
-$13 million to add sub sidings and an interchange track to address congestion from Canada to the U.S.
-$11 million for centrailized traffic control to improve service from Bismarck, N.D., to Fargo, N.D.
-$8 million to add sub sidings and conduct signal work along track from Fargo, N.D., to Minot, N.D. The company also recently issued a request for proposal to major rail-car manufacturers to submit bids for the construction of 5,000 next-generation tank cars used to move crude oil.